Das Möbel – Don’t just eat at the table, buy it! Das Möbel, or ‘the furniture’, is a quirky place whose unique selling point is that everything (yes, everything) in the building is for sale. From bookcases to chairs, tables to clocks, you can buy it all. Of course, there’s also food and drink, but it’s interesting to look at all of the things besides. Having said all that, I seriously doubt that all but the most well-off could afford more than a designer lampshade. It is undoubtedly top quality and far sturdier than what you’d find in IKEA, but the craftsmanship on display, and the hundreds of man-hours invested, commands eye-watering prices. On the other hand, Das Möbel is very eclectic, an excellent place to visit if you’re looking for inspiration for your own interior decoration ideas. The food is fresh and there is the usual tea and coffee on the menu. The general standard in Vienna, it’s easy to forget, is pretty amazing, which is something I always remember when I visit cafes in other places. 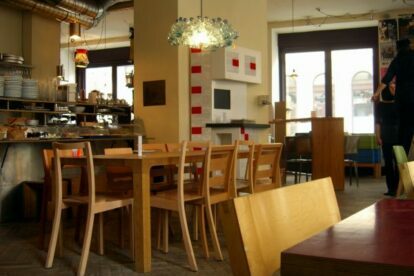 Das Möbel is located in a charming area of the city and this is reflected by the general friendliness of the staff. It is also a favourite hangout of hipster, trendier types. Nearby is the ‘Spittelberg’, a cobbled collection of streets in the 7th district; Burggasse is one of the most interesting streets in the city. Transport connections include the 49 tram and the U3.